Xillybus Lite is a simple kit (IP core + driver) for easy access of registers in the logic fabric (PL) by a user space program running under Linux on Xilinx Zynq-7000 EPP. Read and write operations take place as in a bare-metal program, with plain assignments involving a pointer to the registers. The pointer is initialized with a simple procedure, which can be copied from a demo program. Each use of this pointer induces an access cycle on the bus (memory caching is disabled on the allocated memory region) with an access rate of ~ 7M/sec. Xillybus Lite is hence no substitute for DMA-driven data transport. The IP core handles the interface with the processor's AXI Lite bus, and presents a trivial local bus interface to the application logic. 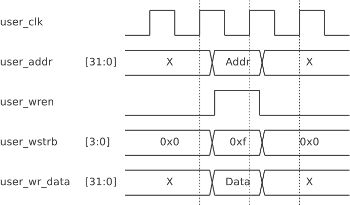 User interface waveforms are shown to the right. There is also an interface for a hardware interrupt, allowing a Linux process to sleep until the interrupt signal is triggered. Xillybus Lite is deployed for immediate use on Xillinux (versions 1.1 and up). For inclusion in a non-Xillinux project for Zynq-7000, download the kit's bundle. Refer to the list of documents or download The Guide to Xillybus Lite.